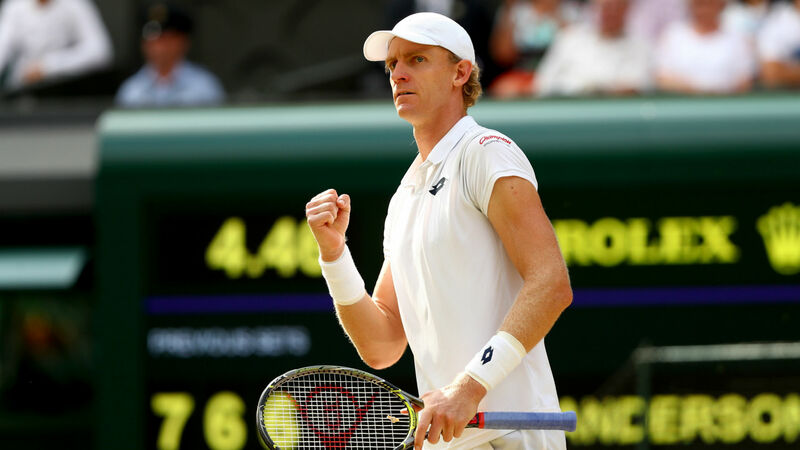 LONDON — Everyone knew the Wimbledon semifinal between John Isner and Kevin Anderson was going to be a slog, and it well and truly lived up to the billing. By finally finishing 7-6 (8-6), 6-7 (5-7), 6-7 (9-11), 6-4, 26-24 to Anderson after six hours and 35 minutes, it became the longest last-four clash in the history of the championship and the second-longest men’s singles match at the All England Club. However, it is unlikely to be remembered as a classic in terms of quality. The crowd grew restless as it left Centre Court ticket-holders waiting far longer than anticipated to watch icons of the sport Rafael Nadal and Novak Djokovic resume their enduring rivalry with a 52nd meeting on the ATP Tour in the other semifinal. He was made to wait an hour and 18 minutes longer for his wish to finally come true. Yet it was a remarkable feat of endurance from eighth seed Anderson, who fought back from two sets and match point down to defeat eight-time champion Roger Federer, 2-6, 6-7 (5-7), 7-5, 6-4, 13-11, in the quarterfinals. It is even more incredible when considering that the South African has had to contend with knee, shoulder, groin, hip, thigh and ankle injuries since 2016 that sent him tumbling from the top 10 down to 80th in the rankings. Having spent close to 11 hours on-court in his last two matches, he has earned his place in a second Grand Slam final in under a year — a chance to avenge his 2017 U.S. Open loss to Nadal could be in the offing. Isner’s reputation as Wimbledon’s veritable marathon man — having taken a record-breaking 11 hours and five minutes over the course of three days to see off Nicolas Mahut, 6-4, 3-6, 6-7 (7-9), 7-6 (7-3), 70-68, in a 2010 match — is now comfortably assured, despite him being on the losing side this time. Given that Isner and Anderson are first and second, respectively, for tie-breaks contested on the circuit this year — the American taking part in 42 and his opponent having been involved in 31 prior to their meeting in SW19 — it was unsurprising that they went beyond 12 games in four of their five sets. Both players are rangy, big-serving heavy hitters, and they were never going to provide a display of anything else. The crowd had a glimpse of what was in store in just the third game, which consisted of three break points and eight deuces before Anderson held serve after 13 minutes. And nothing had changed by the time the 35th game of the painful decider came around, again encapsulating why this had become become such a mammoth clash. Anderson created two break points that would have put him in a position to serve out the ailing proceedings, but Isner responded to hold by firing down a pair of powerful aces — he now holds the record for the most in a single championship having passed Goran Ivanisevic’s 212 in 2001. The decisive moment came in game 49 of the decider, when Anderson lifted himself off the floor, kept the point alive with a left-handed shot and went on to complete just the sixth break of the match. Isner had nothing left to give, and his wait for a first Grand Slam final appearance will not come until at least the 42nd attempt, which is the record begrudgingly held by David Ferrer. Anderson suggested in the aftermath that change was needed at the Grand Slams to stop players from being forced to keep playing for so long. On the evidence of that semifinal, it is hard to argue against it.